About four o'clock in the afternoon the steamboat with Keshab and his Brahmo followers cast anchor in the Ganges alongside the Kāli temple at Dakshineswar. The passengers saw in front of them the bathing-ghat and the chandni. To their left, in the temple compound, stood six temples of Śiva, and to their right another group of six Śiva temples. The white steeple of the Kāli temple, the tree-tops of the Panchavati, and the silhouette of pine-trees stood high against the blue autumn sky. The gardens between the two nahabats were filled with fragrant flowers, and along the bank of the Ganges were rows of flowering plants. The blue sky was reflected in the brown water of the river, the sacred Ganges, associated with the most ancient traditions of Aryan civilization. The outer world appeared soft and serene, and the hearts of the Brahmo devotees were filled with peace. Sri Ramakrishna was in his room talking with Vijay and Haralal. Some disciples of Keshab entered. Bowing before the Master, they said to him: "Sir, the steamer has arrived. Keshab Babu has asked us to take you there." A small boat was to carry the Master to the steamer. No sooner did he get into the boat than he lost outer consciousness in samādhi. Vijay was with him. M. was among the passengers. As the boat came alongside the steamer, all rushed to the railing to have a view of Sri Ramakrishna. Keshab became anxious to get him safely on board. With great difficulty the Master was brought back to consciousness of the world and taken to a cabin in the steamer. Still in an abstracted mood, he walked mechanically, leaning on a devotee for support. Keshab and the others bowed before him, but he was not aware of them. Inside the cabin there were a few chairs and a table. He was made to sit on one of the chairs, Keshab and Vijay occupying two others. Some devotees were also seated, most of them on the floor, while many others had to stand outside. They peered eagerly through the door and windows. Sri Ramakrishna again went into deep samādhi and became totally unconscious of the outer world. As the air in the room was stuffy because of the crowd of people, Keshab opened the windows. He was embarrassed to meet Vijay (see picture), since they had differed in certain principles of the Brāhrno Samaj and Vijay had separated himself from Keshab's organization, joining another society. "He who is called Brahman by the jnanis is known as Ātman by the yogis and as Bhagavan by the bhaktas. The same brahmin is called priest, when worshipping in the temple, and cook, when preparing a meal in the kitchen. The jnani sticking to the path of knowledge, always reasons about the Reality, saying, 'Not this, not this'. Brahman is neither 'this' nor 'that'; It is neither the universe nor its living beings. Reasoning in this way, the mind becomes steady. Then it disappears and the aspirant goes into samādhi. This is the knowledge of Brahman. It is the unwavering conviction of the jnani that Brahman alone is real and the world illusory. All these names and forms are illusory, like a dream. What Brahman is cannot be described. One cannot even say that Brahman is a Person. This is the opinion of the jnanis, the followers of Vedanta philosophy. "But the Reality is one and the same. The difference is only in name. He who is Brahman is verily Ātman, and again, He is the Bhagavan. 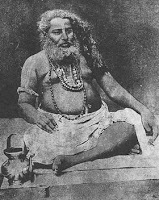 He is Brahman to the followers of the path of knowledge, Paramatman to the yogis, and Bhagavan to the lovers of God." The steamer had been going toward Calcutta; but the passengers, with their eyes fixed on the Master and their ears given to his nectar-like words, were oblivious of its motion. 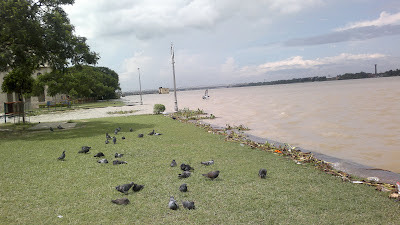 Dakshineswar, with its temples and gardens, was left behind. The paddles of the boat churned the waters of the Ganges with a murmuring sound. But the devotees were indifferent to all this. Spellbound, they looked on a great yogi, his face lighted with a divine smile, his countenance radiating love, his eyes sparkling with joy-a man who had renounced all for God and who knew nothing but God. Unceasing words of wisdom flowed from his lips. MASTER: "The jnanis, who adhere to the non-dualistic philosophy of Vedanta, say that the acts of creation, preservation, and destruction, the universe itself and all its living beings, are the manifestations of Śakti, the Divine Power. If you reason it out, you will realize that all these are as illusory as a dream. Brahman alone is the Reality, and all else is unreal. Even this very Śakti is unsubstantial, like a dream. "But though you reason all your life, unless you are established in samādhi, you cannot go beyond the jurisdiction of Śakti. Even when you say, 'I am meditating', or 'I am contemplating', still you are moving in the realm of Śakti, within Its power. "Thus one cannot think of Brahman without Śakti, or of Śakti without Brahman. One cannot think of the Absolute without the Relative, or of the Relative without the Absolute. "The Primordial Power is ever at play. She is creating, preserving, and destroying in play, as it were. This Power is called Kāli. Kāli is verily Brahman, and Brahman is verily Kāli. It is one and the same Reality. When we think of It as inactive, that is to say, not engaged in the acts of creation, preservation, and destruction, then we call It Brahman. But when It engages in these activities, then we call It Kāli or Śakti. The Reality is one and the same; the difference is in name and form.